Carpenter bee activity is on the increase. The activity near the end of March and early April was mostly males which have the white spot on the front of their head. They are also the ones that often terrorize people sitting on a wood bench or on their deck which are likely home to overwintering females in previous years’ galleries. After mating, the female begins the task of drilling out a new tunnel (see at right) which will house her offspring in individual cells within the gallery. There are still no “silver bullets” for preventing carpenter bees from drilling other than using non-wood composite building materials. 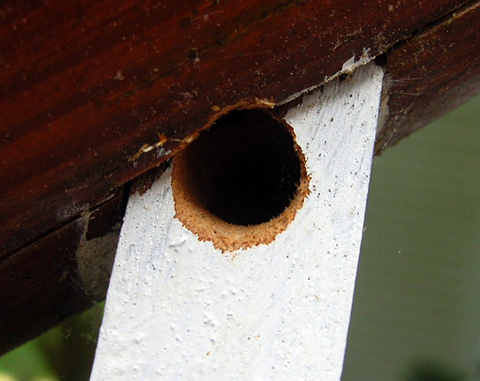 Favored targets for the bees are area such as fascia boards, trim. Porch rails and spindles (balusters). Some people use carpenter bee traps which will catch some bees but whether they control the bees is in the eye of the user. Surface sprays typically have limited surface residual to be truly effective (or durable). We still recommend applying an insecticidal dust to the holes and then caulking them about 24 hours later. Remember that when you’re spraying/dusting a carpenter bee gallery, keep a safe distance between your face and any possible backsplash. Be equally careful if spraying up over your head (the laws of gravity apply to pesticides, too!) 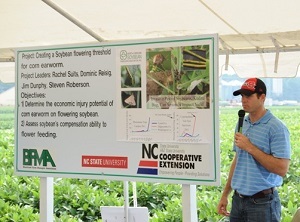 Consult the NC Ag. Chemicals Manual page (170) for chemicals that can be used for this job. 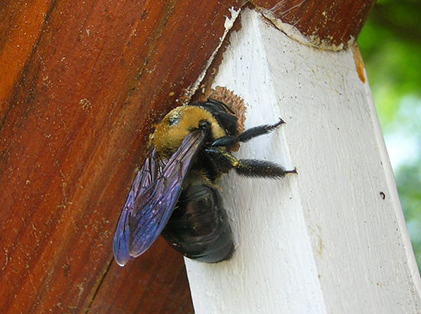 More information about carpenter bees.